Pipe stress analysis - Y piece | Page 2 | MES LAB - Be Professional! Discussion in 'CAE & CÁC PHẦN MỀM MÔ PHỎNG' started by progiangbk, Jul 26, 2012. 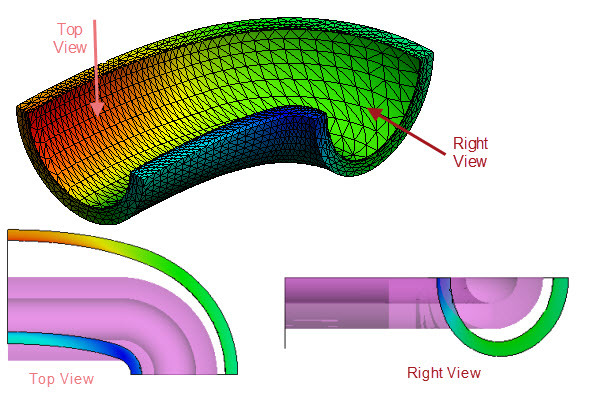 Thí dụ dùng Ansys Shell element Type, Tính cục bộ local Y Piece:. - Phải biết đưa điều kiện biên hợp lý. A pipe rack with elevated risers and expansion loops. Red pipe in the middle is the full system. 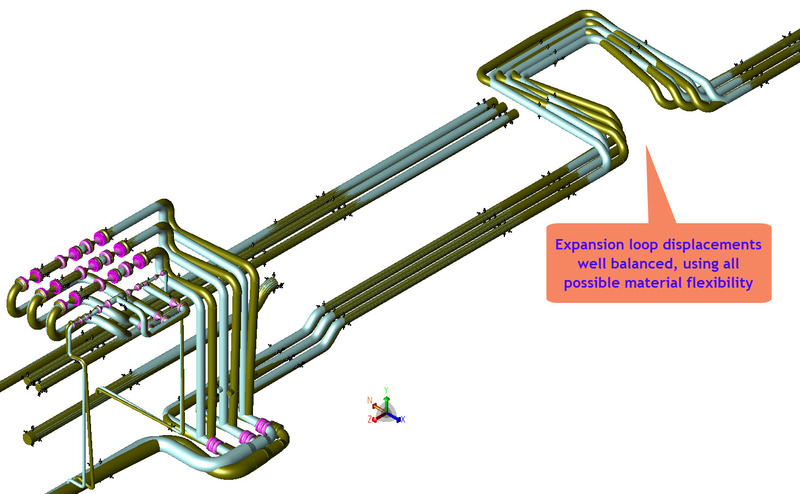 Top and bottom pipes in blue are details. Motions are shown below. Motion of pipes in the pipe rack with elevated risers. Attention is paid to optimizing the design of the loop while keeping motions and loads in the rest of the system within limits. A tower with a guided flexible pipe connection. The guided connection allows the flexibility required in the nozzle while limiting the loads applied to the vessel nozzle. 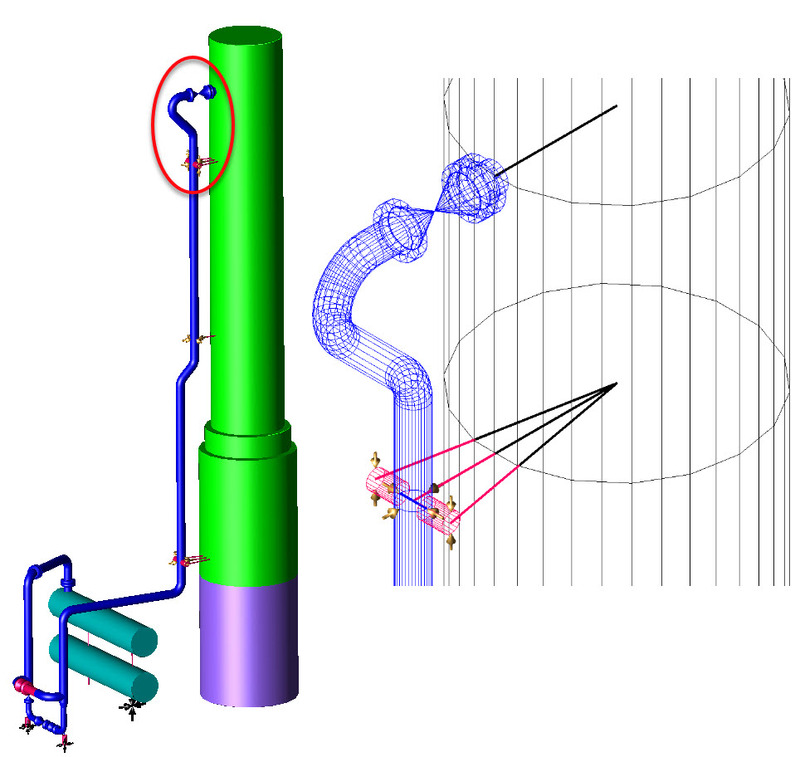 Modelling the flexibility of the nozzle and accounting for the different possible temperatures of the piping system and tower is required for successful analysis. 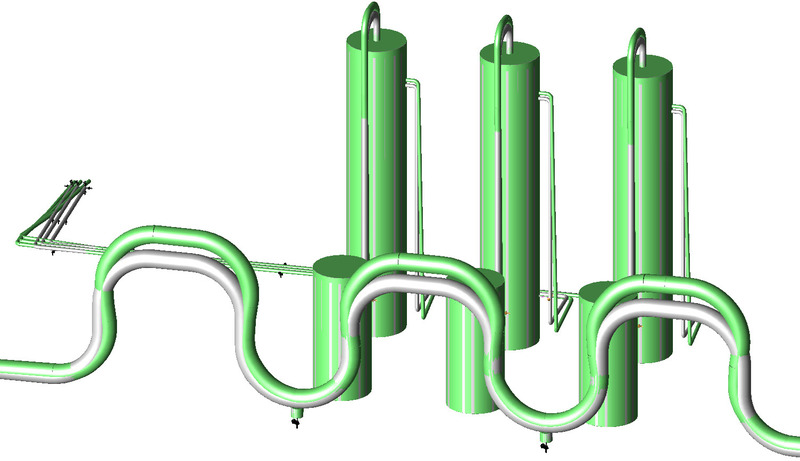 Stress analysis of a pump skid from storage towers to dual pumps. The temperature distribution of the piping varies depending on which pump or pumps are running. Here the pipes leading to the operating pump are hotter than the standby pipes. 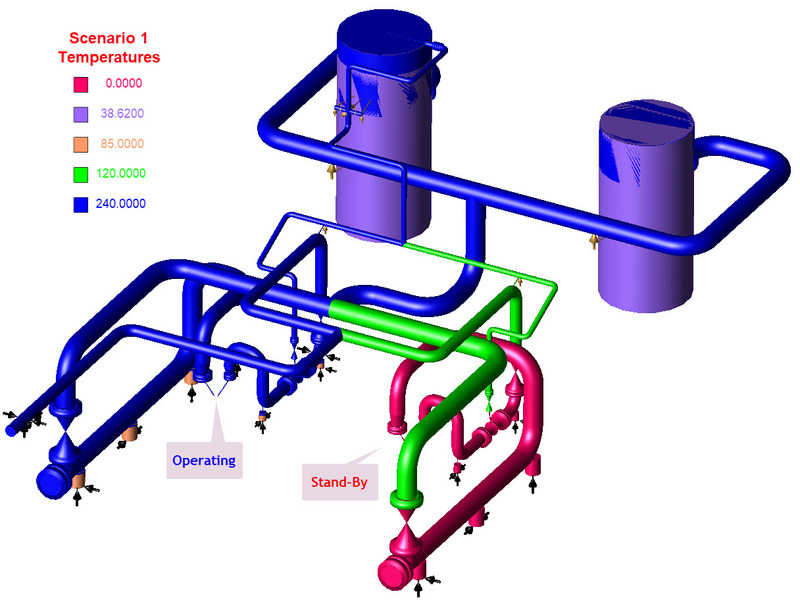 Multiple load cases are required to ensure the piping design is acceptable. 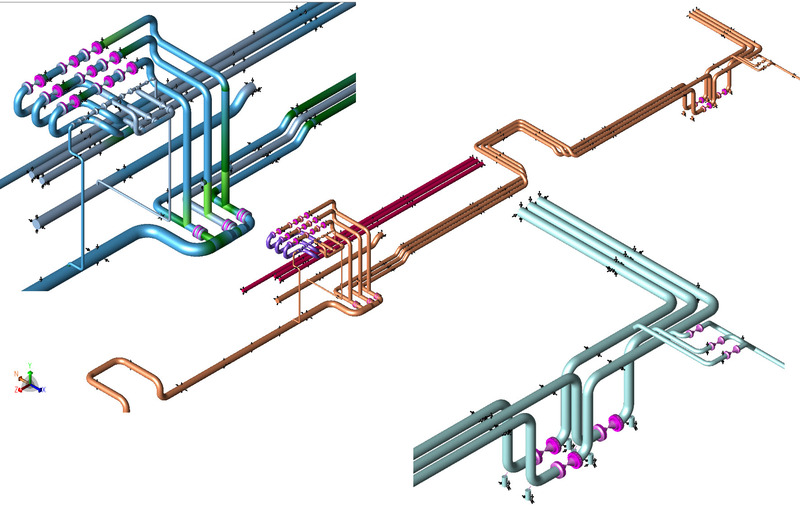 Pipe stress analysis of the fictional but artistic piping system shown on our homepage. Displacement of the bend under pressure magnified 2000x. Displacement is calculated first. Here the displaced shape has been magnified 2000x. It can be seen from the top view that under pressure the legs separate. The diameter also grows, but not from the centerline. The displaced shape is complex enough that the analyst cannot easily predict it. From this it is expected that the stress pattern will also be complex. 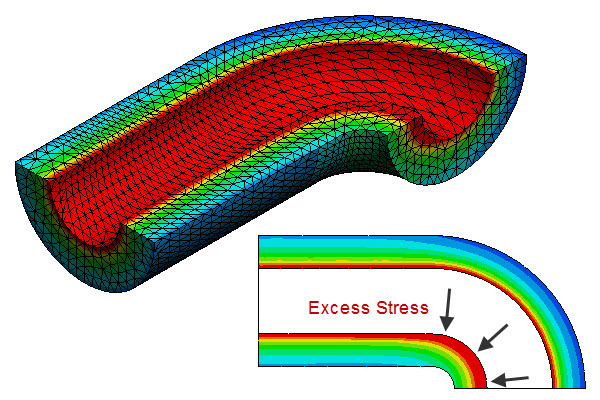 Stress plot with area of excess stress shown. The design fails.